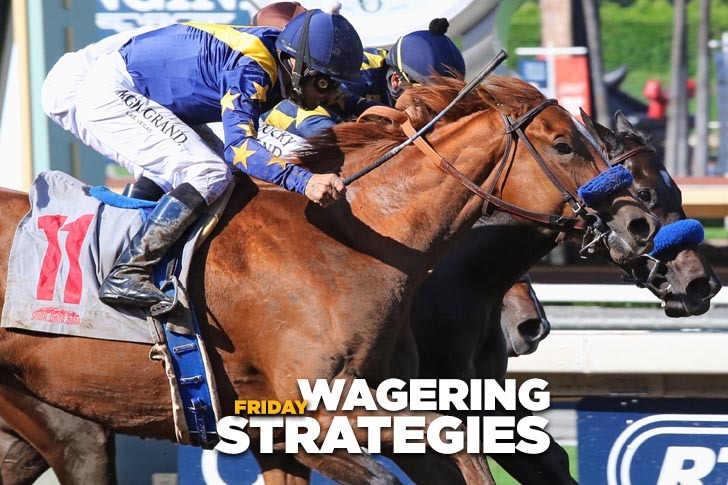 ​Unless otherwise noted, all horses listed in the analysis should be used in rolling exotic play. Usually there will no more than three horses listed; occasionally, Jeff will go 4-deep in his rolling exotic play and on a very rare occasion he will recommend a “buy the race” strategy. X=likely winner but odds will be too short to play. Forecast: Frankincense is a one-paced grinder but continues to work well for Mandella and probably has a bit more improvement in him then some of the other exposed maidens in this one mile turf affair. Prat stays aboard and from the rail the son of Frankel could draft into a nice second flight position. Rumpus Cat removes blinkers and is stretching out for the first time for a barn that has excellent stats with both angles. He seems certain to employ gate-to-wire tactics. Both should be included in rolling exotic play. Forecast: Backintheacademy plummets to what appears to be her proper level and should regain her best form in a modest field of $8,000 claiming fillies and mares. The Miller-trained mare has good tactical speed and numbers that are more than good enough to beat this type of field. Jill Madden is a need-the-lead type moving up a level for Mulhall via a claim following a solid score vs. $6,250 foes last month. On paper she’s the controlling speed once again, so we’ll include this daughter of Grazen in our rolling exotics. Forecast: Over Par is just one-for-17 in his career with the evidence clearly suggesting that he lacks a winning punch. Second in his last pair, most recently in a photo vs. state-bred entry level allowance types, the O’Neill-trained gelding shows up in a restricted (Nw-2) $50,000 downhill turf sprint and based strictly on numbers appears the one to beat, though certainly not really one to trust. Fortune of War is another non-winner type (he’s 1-for-17) but could produce the last run if held up early. Bear Chum is an invader from Hong Kong with a recent bullet drill leading up to his U.S. debut. He’s a first-time gelding and first-time Lasix, so he’s eligible to be much better than his modest Far East form would indicate. Toss him in. Forecast: Captivate has decent form in straight maiden company and today shows up in a claimer for the first time in his second start off a layoff. The Puype-trained gelding has numbers that are better than par for the level, faces a weak group, and seems like the logical top pick by default. We can use him as a rolling exotic single. Forecast: We’ll go three-deep and hope that’s enough in this restricted grass grab bag for $35,000 older runners. Bold Papa has becomes a solid and consistent performer of late and shows speed figures that are gradually rising. The veteran Papa Clem gelding exits a first-level allowance race in which he finished a close second, retains Bejarano, and should be prominent throughout and have every chance. Beantown Boys and Seau finished two-three in a similar claimer on dirt and both can be expected to perform just as well today on grass. Preference goes to Bold Papa and we’ll have an extra ticket or two keying him on top. Forecast: Oliver flashed good speed in a bullet gate work May 31 (35 1/5 seconds) and debuts in a moderate state-bred maiden special weight five furlong dash. Talamo was aboard for that drill and gets the mount; this colt’s full brother (Quantum Force) was a very impressive debut winner at Los Alamitos as a two-year-old. At 5-1 on the morning line he’s a straight play and rolling exotic single. Forecast: Top-to-bottom a chance in this first-level Hillside allowance sprint for 3-year-olds; we’ll use three but would feel more comfortable simply buying the race. Heartfullofstars is a first-time gelding for D’Amato and retains Nakatani after missing by a neck under these conditions last month. He’s worked well since and should fire a big shot. Calexman looks like the controlling speed, and if can shake loose early he’ll surely be tough to catch. More Honor broke his maiden over this course and distance two races back but was out of his element in the two-turn Singletary Stakes in his most recent outing. He’s back at his preferred trip, removes blinkers, and should be dangerous from off the pace. Forecast: Princess Areni, second in all three of her career starts, may have found a field she can beat. The Baltas-trained filly gets a break in the weights with the switch to bug boy Espinoza, and after a tough beat at 4/5 in her last start looks capable of making amends with this drop into the maiden $30,000 ranks. Brandon’s Law drops, shortens up, and returns to dirt in her first start since last March. This is a bit of suspicious class drop – there was nothing wrong with her runner-up over a mile on turf vs. $50,000 foes in her last start – but because she’s from the Cerin she has to be included.